Watch Out Stink Bugs – there’s a mighty predator after you! The other morning I got a call from a gardener who was having trouble with her rose bushes. “Something is eating them”, she said. “There are stink bugs on them and also some praying mantises. I wonder if either of them could be the culprits.” I assured her that the praying mantises would not be eating her rose leaves because they are insectivores and therefore do not eat plant material; but the stink bugs were another matter. “Are the rose leaves being chewed or are they more stippled with little holes all over?” I asked. Hmmm, that’s pretty classic stink bug damage. 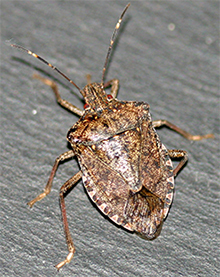 Stink bugs have piercing/sucking mouth parts and they feed by sucking the juices from leaves, stems and flower buds. Apparently they were all over her roses. Praying mantis with a "death grip" on a stink bug! 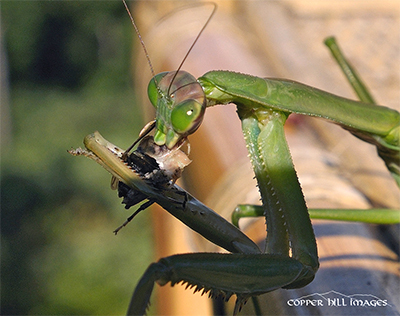 Later that afternoon, I received an e-mail from a longtime listener to “In the Garden with Andre Viette” that had an attached photo of (drum roll please) a praying mantis chowing down on a Brown Marmorated Stink Bug! Whoa, what an amazing shot and what a coincidence that he caught it on “film” and happened to e-mail it to us the day I got this question! Thanks to Nicholas R. of Copper Hill Images for these incredible photos! And thanks for clearing up the mystery of whether they eat stink bugs. 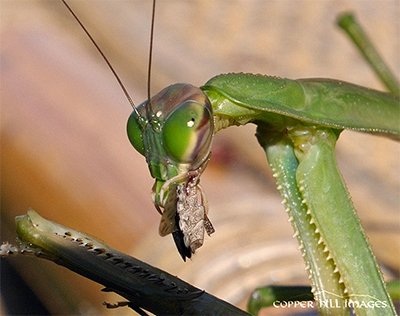 So it seems that praying mantises do find these nasty bugs rather palatable! I don’t think I am alone when I say that I’m not looking forward to the time when hordes of these vile insects begin to invade our homes in search of a warm, cozy place to spend the winter. Based on the numbers I saw in our vegetable garden this summer, it’s going to be bad! Many of our vegetables, including tomatoes, sweet peppers, and cucumbers, had visible damage from the sucking mouthparts of stink bugs. 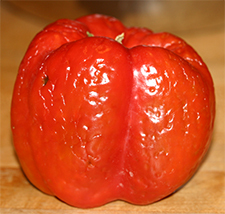 A red pepper damaged by stink bug feeding. We haven’t sprayed pesticides in our garden for years but after the devastation we suffered to our bean crop from Mexican bean beetles and the damage to other vegetables from the stink bugs, I think we are going to have to do some spraying next season. Crop rotation is one of the best ways to reduce insect and disease problems in the vegetable garden and we do practice this each year but apparently it wasn’t enough this season. We had very little disease, though. I think this was due in part to the crop rotation but also to the cover of straw mulch which kept soil from splashing up onto the stems and leaves of the vegetable plants. 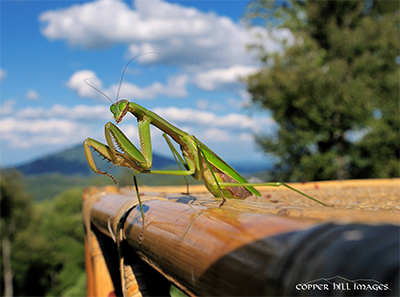 Anyway, back to the praying mantis! When I work in my “natural” garden in the fall, I often come across praying mantis egg cases. These are puffy, tan masses that are attached to the stems of various plants. I often see them on goldenrod and on my ornamental grasses. If you find them, leave them in the garden! The nymphs will hatch out in the spring and immediately go to work noshing on all kinds of insects. They are very efficient and ferocious predators – especially after they grow up! 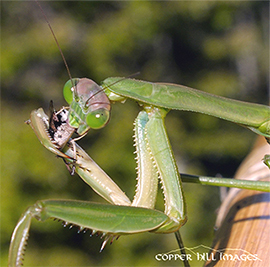 Some people will even cut branches or stems that have praying mantis egg cases attached to them and tie them to plants in their gardens with the hope that when they hatch they’ll stick around to prey on insect pests in their landscape. 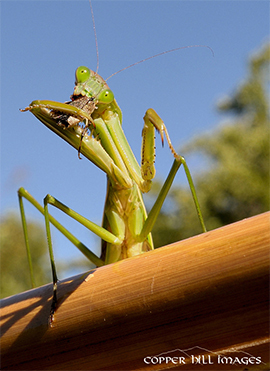 Unfortunately the praying mantis isn’t especially discriminating of its prey and will devour non-pest insects just as quickly as it will a pest species. Oh well – if they eat their share of stink bugs, that’s alright with me! More photos from Nicholas of Copper Hill Images and check out the beautiful photo galleries on his website. Almost gone! So long stink bug and good riddance. Recently, it seems that everywhere I look mushrooms are popping up! They are especially noticeable in the lawns and fields I pass by on my way to work. I guess our recent rains have triggered some of the fungi growing in the soil to push up their fruiting bodies, a.k.a. mushrooms. The club fungi, which make up the group Basidiomycetes, are probably the most familiar of all the fungi because they produce very visible fruiting bodies like the gill mushrooms and puffballs. There are about 60 different species fungi that will form fairy rings. The underground growing portion of these fungi, the mycelium, is made up of long threadlike strands which are dispersed throughout the soil. The mycelium secretes enzymes that are responsible for breaking down organic matter in the soil releasing nutrients to feed the fungi. Eventually the mycelium produces reproductive structures/fruiting bodies (mushrooms or puffballs) which contain spores. The fungal spores are dispersed by various means; wind, water, or “critters”, and when they come to rest in a suitable environment, they germinate and form a new mycelium. Hmmm, the life cycle of Basidiomycetes in a nutshell! Probably more than you ever wanted to know but it gives a little background for the subject of my post. One of the most interesting formations created by mushrooms is the “fairy ring”, a circular ring of mushrooms that is often found in fields, lawns, and even wooded areas. For eons, fairy rings have been the subject of myths, folk tales, and superstitions. The name “fairy ring” comes from old folk tales from the British Isles that describe these rings as marking the path of dancing fairies. There are loads of other wild stories in folklore from many different countries which expound upon the origin of fairy rings. The fruiting bodies, mushrooms in this case, pop up just inside the outer edge of the mycelium. The scientific explanation for the formation of fairy rings is a little less whimsical! 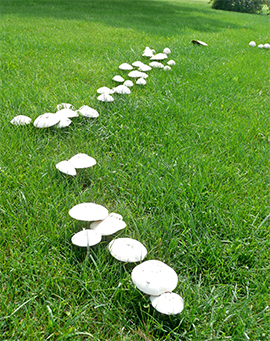 There are about 60 species of fungi that typically produce fairy rings. They begin when a single spore germinates and the resulting mycelium grows outward in a circular pattern. In the first year it may produce a small cluster of mushrooms. As the mycelium grows outward obtaining nutrients from organic matter in the soil, the circle expands. Since the mushrooms pop up near the edge of the growing mycelium, they form an ever widening ring each year. Some years, if conditions are not favorable, the fruiting bodies may not appear but the mycelium continues to grow unseen beneath the surface of the soil. Eventually the supply of organic matter in the inner portion of the circle becomes depleted and the strands of mycelium in the center die. The living mycelium continues to grow outward seeking nutrients and depending on the soil type, weather conditions, and the amount of organic matter in the soil, the fairy ring may increase in size by 3″ to 19″ each year. 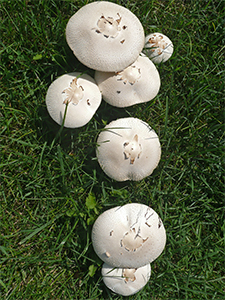 Since they don't all pop up at exactly the same time, a fairy ring can have several different sizes of mushrooms. A fairy ring may continue to grow unchecked for many years unless it hits some type of physical barrier or it grows into another fairy ring. If it runs into another fairy ring, growth of that section ceases but the rest of the ring continues to grow outward resulting in the formation of a scalloped edge. One of the largest fairy rings ever recorded was discovered in France and is reported to be almost ½ mile in diameter and over 700 years old! Fairy rings are most obvious when they occur in lawns where they are often accompanied by a ring of lush, bright green grass or sometimes a ring of dead grass. 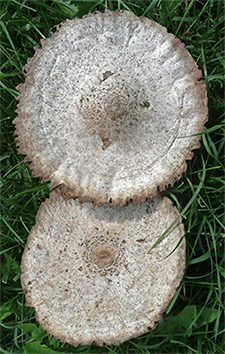 The growth pattern and effect on the turfgrass depends on the species of fairy ring fungi. My co-worker, Gerry Coggin, snapped these photos of a fairy ring growing in a churchyard near his home. Cool! The GALL of those gnats! As summer comes to a close and the beautiful fall season is upon us, I am enjoying the last blooms of our daylilies, Coreopsis, hardy hibiscus, and summer phlox. But fall doesn’t spell the end of color in the perennial garden. I am eagerly looking forward to the late blooms of Helianthus, goldenrods, chrysanthemums, sedums, and Japanese anemones. Ornamental grasses are in their full splendor now and are providing a tall, wispy look in the garden. The large broccoli-like flower heads of the taller sedums like ‘Autumn Fire’, ‘Brilliant’, ‘Neon’, and ‘Carmen’ are beginning to color up and are now usually so covered with butterflies and bees that the flowers seem alive with all the activity! Of course the Rudbeckia, Echinacea, and butterfly bushes will continue to bloom through the fall. A goldenrod bunch gall stops the growth of the main stem but side shoots soon assume apical dominance and produce flowers for the plant. In my “natural” garden (i.e. the one that was never weeded and has basically returned to its native state), the colorful Canada goldenrod is beginning to flower. 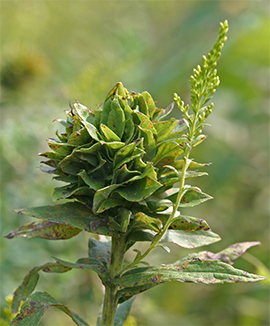 Throughout a large patch of this goldenrod, many of the main stems are topped by a dense, bushy rosette of stubby foliage. This abnormal growth of tissue is actually a type of gall which is caused by the larva of a small gnat called the goldenrod gall gnat (Rhopalomyia solidaginis). The presence of the larvae feeding on the goldenrod stem prevents further elongation of the stem. Since the plant continues to produce leaves but no stem growth, a bushy mass of leaf tissue, a “bunch gall”, forms at the top of the stem. Eventually side shoots begin to grow below the gall just as if the main stem had been pinched out. The side shoots grow upward and flower normally. A goldenrod stem gall appears as a swelling on the stem but does not affect stem growth above it. Another common goldenrod gall is the goldenrod ball gall or stem gall. This gall is caused by the larva of the goldenrod gall fly (Eurosta solidaginis) which is about the size of a house fly. 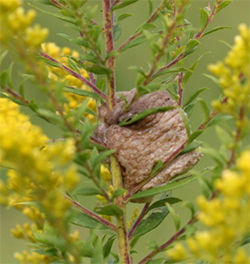 Unlike the larva of the goldenrod gall gnat, this species does not interfere with stem elongation and the main stem continues to grow upward relatively normally. 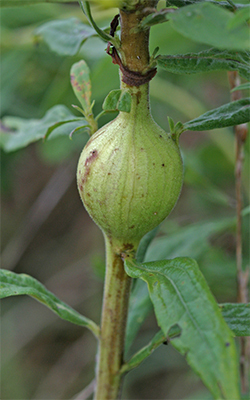 The gall forms as a swelling of the tissue at the location where the larva is feeding inside the stem. These galls, generally found about halfway up on the stem, are quite obvious especially in the fall and winter after the leaves dieback and the stem dries. The larvae overwinter in the galls where they can actually survive the freezing of their body tissue. In the late spring after a short two week pupal stage, they emerge as adult flies. Stem galls do not affect the ability of the goldenrod to thrive and produce their beautiful showy flowers. Canada Goldenrod (Solidago canadensis) and Tall Goldenrod (Solidago altissima) are the exclusive host species for the goldenrod gall fly and the preferred hosts for the goldenrod gall gnat. Though they look pretty detrimental to the goldenrod, these galls don’t seem to affect the plant’s ability to flower and produce seed. So now you’ll know something about these strange growths when you see them on goldenrod stems! 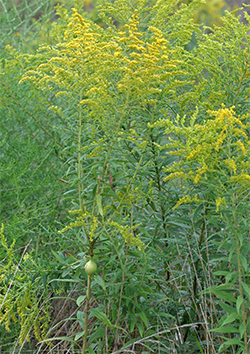 And remember … Don’t blame the goldenrod for your allergies this time of year – it’s the ragweed!